Snowdrop time – For the fainthearted . . . It is said that it is an ill-wind that blows no-one any good, so, despite its icy chill, the bitter wind blowing before dawn today must have been a good wind, for there was no sign of frost. The plain Protestant church building at Roskelton crossroads is one of those churches built for no reason other than it was more than three miles from the town and an Act of Parliament decreed that members of the Nineteenth Century Church of Ireland should not have to travel more than three miles in order to attend worship. Roskelton has a special place in my affections; it is a place of silence. Arriving always before 8.45 means having forty-five minutes before the morning service starts; time to be quiet, to think and to pray. But today was a special day, it was snowdrop time. 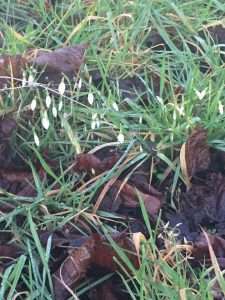 It is five years now since I first realized that in a corner of Roskelton churchyard, I could find the first white, delicate blooms at the beginning of a New Year. 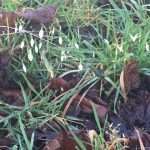 It was on a Saturday in January 2012 that I was wandering among the gravestones and first spotted the snowdrops. In an unkempt grave, from beneath the cover of the dead leaves from the previous autumn, they had made their appearance. Their presence, at a time meteorologists would describe as mid-winter, seemed a declaration of triumph over the dark season; throw at us what it might, the days had turned, the light would be coming back, we were unbeaten. There was time to ponder what meaning I might ascribe to the Roskelton snowdrops. To those in church, the presence of the flowers on 1st January was just one further sign that the world was not the way it should be. To an ageing cleric, who loves the light and warmth, they were a sign that the summer days are coming.